A few weeks ago I scored an HP/Agilent/Keysight 6060B DC Electronic Load on eBay. Unfortunately most of these come without front binding posts as they are optional (Option 020) and have to be paid extra for. As I'm using this as a bench DC load and not in a rack-mounted test setup I wanted to have these. Luckily I had access to a HP/Agilent/Keysight 6063B DC Electronic Load with front binding posts, which is basically the same DC load with just less current and more voltage specs. and a few screws, washers and nuts. Keysight provides a Find-A-Part service for replacement parts which I searched for the need parts. Unfortunately the label panel and the cable assembly are obsolete. I did not worry to much about the cable assembly but I was not sure if the binding posts would fit without the plastic panel between them and the front panel. So I wrote to the Keysight customer service and asked about the part. They told me that this part has been discontinued as the the information which binding posts is + and which one is - is now printed directly onto the front panel. As the front panel itself is made of 2 mm aluminium I took the risk and ordered the rather costly two binding posts (41.36 € each). After five weeks I received the binding posts. They come with two different size brackets most likely for the usage as back binding posts and front binding posts. There are no screws, washers and nuts included so you will need two M12 nuts, two M12 spring rings, two M5x12 screws with a cylinder head and two M5 washers. For installing the binding posts the front cover has to be disassembled. This is done straight forward by opening the case, disconnecting all the cables and removing the screws on the side and one screw next to the LCD display. To remove the aluminium part off the plastic front cover the power switch has to be removed. The pull the aluminium plate gently off as it is glued onto the plastic part. I recommend NOT to remove the keypad and the display as the plastic bolts break easily (I lost three of them at the keypad). As the plastic front cover is already prepared for the front binding posts with two holes only the aluminium part has to be modified. I asked someone with the right tools to do me a favour and drill the two holes into the plate and add the small noses which will prevent the binding posts from rotating. 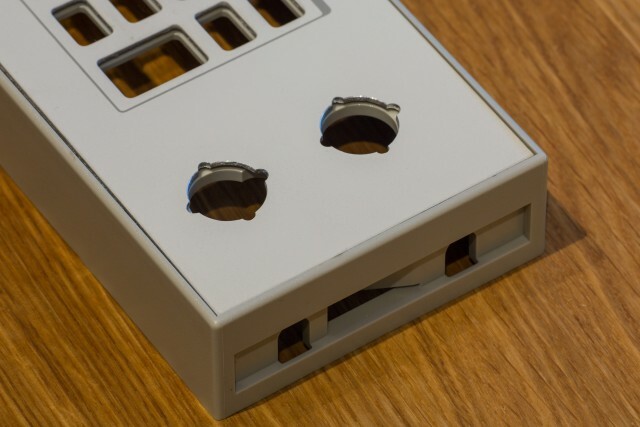 Note that these have different sizes for the top/bottom and left/right and that the binding posts should be mounted in such a direction that the hole for the cables can be accessed from the sides. After mounting the binding posts and reassembling the front cover I connected the front binding posts with the rear binding posts with an 10 mm² (AWG 7-8) cable with two cable shoes with an diameter for M5. The cable itself was mounted onto the side with cable ties like in the 6063B. The label the front binding posts with + and - I used an Epilog Laser-Cutter Zing 6030 with 40 Watts of power at the local fab lab "Die Werke" to engrave the labels. With a setting of 25% speed and 40% power I received good results, which means that the lamination was burned away and the underlying aluminium was visible. I tried several settings before drilling the holes at their position as I wanted to have a perfect try for the real labels. Before installing everything again I did a quick functional test to assure to everything works. It works like a charm and looks very professional like it was installed already by the manufacturer. So I'm quite happy with this upgrade and can recommend it to everybody! PS: In case you're looking for the terminal blocks on the backside they have the Molex part numbers 39530-0010 (10 pin) and 39530-0004 (4 pin) and are available at Digikey under WM7824-ND (10 pin) and WM7953-ND (4 pin). This entry was posted in Test Equipment and tagged Electronic Load, Keysight/Agilent/HP by twam. Bookmark the permalink.